This cake was made for one of Rodney's co-worker's wife. 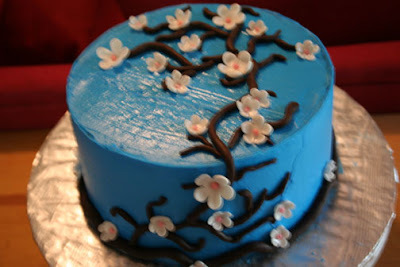 There wasn't much instruction on this cake, just that it have some blue in it and that it be "girly." 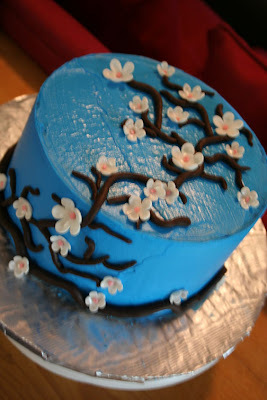 I decided on doing a cherry blossom cake because I absolutely love cherry blossoms (obviously!) and I think most girls do too. This cake is red velvet with vanilla buttercream. 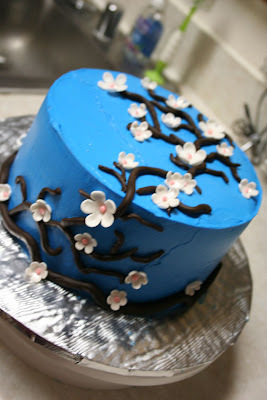 The branches are made from modeling chocolate, the blossoms are made from a 50/50 mmf and gum paste mixture. The blossoms are also painted with white sparkle luster dust. I'm going to add a plaque to the empty space later this evening that says "happy birthday," but I wanted to get some pictures taken without it. I'm really happy with this cake, I love how the colors came out. They seem to compliment one another well. So pretty. I love the shade of that blue! That's so pretty. I bet she loved it!